Experimente dos gemas de Andalucía en un tour de 2 o 3 días a Sevilla y Córdoba. Viaje al sur a través de La Mancha y el campo del sur de España en autobús, y regrese a Madrid en tren de alta velocidad. Admire la arquitectura morisca y el antiguo barrio judío de Córdoba, y visite la Catedral de Sevilla, declarada Patrimonio de la Humanidad, en una visita guiada a pie. Disfrute del tiempo libre para explorar Sevilla por su cuenta y pase la noche en un hotel de cuatro estrellas. Ver las vistas iluminadas por la noche. I enjoyed the tour a lot, the guide was nice and accommodating, he knew his job. The best part of the tour was the hotel in Sevilla. The room was nice and very comfortable. Sevilla was beautiful. If I come back with friends or family I would take the same tour again. Actually, would give this trip a 3.5 but half stars not an option. Good points- Bus was comfortable and tour was not full so plenty of room to spread out. Local tour guides in Cordoba and Seville were competent and engaging. These tours were quite good. Hotel in Seville was clean and good quality. Hotel location was good within walking distance of major attractions. Complimentary breakfast was well done. High speed train back to Madrid very fast and efficient. Bad points- Be prepared for several hours bus travel which was not made any better by tour guide on bus. She was pleasant but definitely had very limited English skills so explanations more extensive in Spanish and very sparse in English. Lunch at roadside stop overpriced and very mediocre. 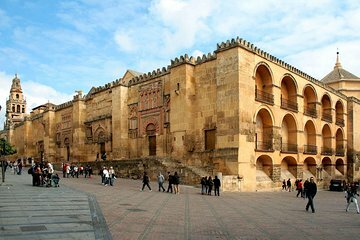 Although tours in Cordoba and Seville are good, they are bilingual so be prepared for idle time during Spanish parts. Complimentary dinner at Seville Hotel worthless and should be skipped. Seville has many excellent reasonably priced tapas restaurants, several within stones throw of Hotel. On balance, this tour was a good value for the price, but there are definitely a few things that detract from the overall experience. Seville and Cordoba are fabulous places to visit and would love return to Seville in the future.